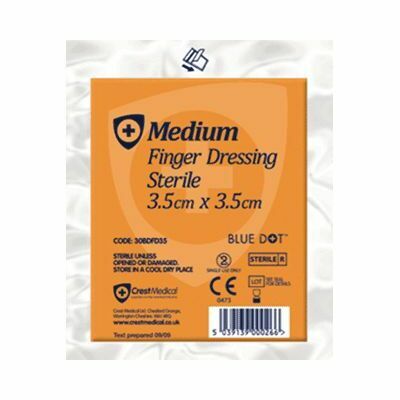 An essential addition to your catering First Aid box, our Finger Dressing 3.5cm x 3.5cm is suitable for a range of wounds. Shaped into small dots, each one can be placed across small hand cuts and are easily secured with a long lasting adhesive strip around the border. Manufactured in a bright blue colour which stands out should it fall into food or around your cooking area, they are individually wrapped for both easy storage and to maintain their sterile nature. Easy to apply in any situation and suited to all working environments, ensure your stocks are always topped up fully with this handy pack of finger dressings. Our First Aid & Medical Category is full of handy items to keep your First Aid boxes fully stocked. From our Washproof Tape Blue 2.5cm x 5m through to the Hydrogel Burns Dressing and all at exceptional wholesale prices. Splinter Forceps Stainless Steel 4.5"